As part of ABIM’s ongoing collaboration with medical societies to understand how ABIM programs can better meet the needs of physicians, we hosted the bi-annual Liaison Committee on Certification and Recertification (LCCR) meeting in early April. Board and staff leaders from 30 medical societies attended – the largest gathering in the history of 25 LCCR meetings. Dr. Mariell Jessup, Chair of the ABIM Cardiovascular Board and Chair of the LCCR Planning Committee, welcomed attendees and provided highlights of the day’s agenda. Throughout the day, ABIM and societies engaged in open dialogue about recent program updates and potential program changes. ABIM also shared what it has learned from physicians in the past year, addressed questions from societies about the future of Maintenance of Certification (MOC) assessments and gathered more input from meeting attendees. Dr. Richard Baron, President and CEO of ABIM, noted the importance of working together with societies to hear from their members to enhance the MOC program to be more relevant and less burdensome. At the meeting, ABIM shared the results of the recent all-diplomate survey and discussed ideas for potential assessment enhancements based on the Assessment 2020 Task Force report recommendation to replace the 10-year MOC exam with more meaningful, less burdensome assessments. As reiterated at the meeting, these insights—and others gained through our engagement with physicians and health stakeholders—are central to any decisions ABIM will make about the future assessment models. The societies reflected on how these possible changes might work for their members and how performance assessments might align with physicians’ professional commitment to lifelong learning. Small-group exercises also included discussions on how ABIM and societies can increase synergy when communicating potential MOC changes with physicians and other stakeholders. ABIM and Accreditation Council for Continuing Medical Education staff provided updates on their partnership to recognize CME activities for MOC credit, reporting that more than 2,000 CME activities have been registered for MOC, and more than 2.6 million MOC points have been earned since the program launched in September 2015. Meredith Phillips, American College of Gastroenterology, moderated a panel discussion during which Julie Bruno from the American Academy of Hospice and Palliative Medicine, Heather Dethloff from the American College of Chest Physicians and Ailene Cantelmi from the Endocrine Society shared how they have been able to create MOC-eligible learning sessions that offer greater physician engagement and targeted education. While challenges of implementation were discussed, panel participants were excited about creating new learning opportunities that would offer their members both CME and MOC credit. The final session explored whether enhanced score report data, such as clinical content topic area and associated task (e.g., diagnosis), could be helpful to societies in developing their medical education resources. The day ended with a clearer sense among attendees of what ABIM is moving toward: an MOC assessment that lowers the burden for physicians, keeps pace with rapidly changing medical knowledge and continues to meaningfully signal that a doctor is staying current with knowledge and practice over the course of a career. As ABIM continues to consider changes to its MOC assessment, the input that we receive from society partners is extremely valuable. Through them, we hear the voices of thousands of diplomates. We are confident that continuous collaboration will lead to more meaningful changes. 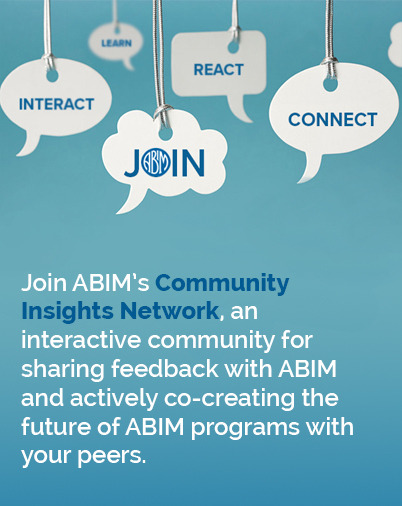 Subscribe to the Transforming ABIM blog for regular updates about these efforts and other ways you can participate.